Over 1000 people attended the Honkin' Haulin' Hands On Trucks Event. 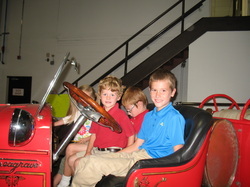 The Beachwood Historical Society was proud to display a 1920's Fire Engine. Dalmatians Romeo and Juliet were there to welcome the children. 2013-Check out the fancy vehicle that the Beachwood Historical Society had on display. Check out who is doing the driving!